Anytime I get to write an article about a long-time NASCAR sponsor, it brings a smile to my face, and today’s article is no exception. 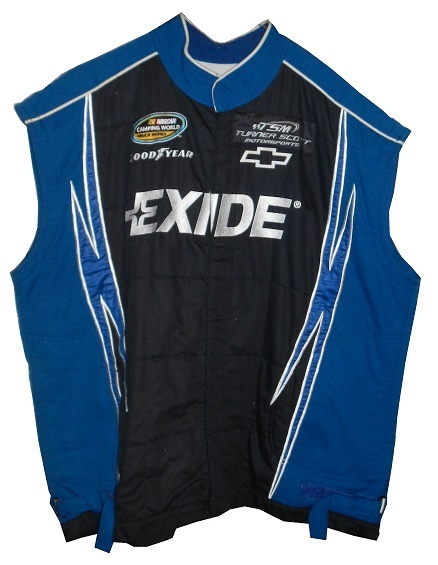 I’m giddy about the fact I get to do an article on an Exide Batteries vest! Growing up in the 1990’s, I remember when they sponsored Jeff Burton in the #99 Ford from 1996 to 2000, and who sponsored him for 14 of his 21 Sprint Cup wins. During the first and second World Wars, Exide provided batteries for military use, which included radios, submarine, and torpedo use. Exide solar-powered batteries were used on the Apollo space missions. Sadly Exide has made a number of bad decisions in its business handling, primarily in acquisitions. Their major problem is that they have made too many of them, and have found themselves in debt in recent years. While I fondly remember the Jeff Burton years, Exide left after the 2000 season. 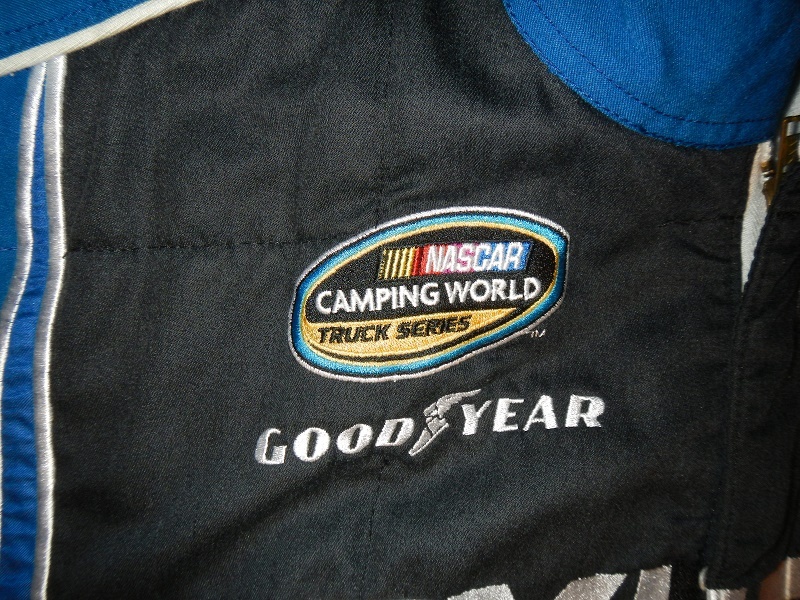 They then resurfaced in the Camping World Truck Series in various places, but we will focus on their sponsorship of Turner Scott Motorsports from 2011-2014. 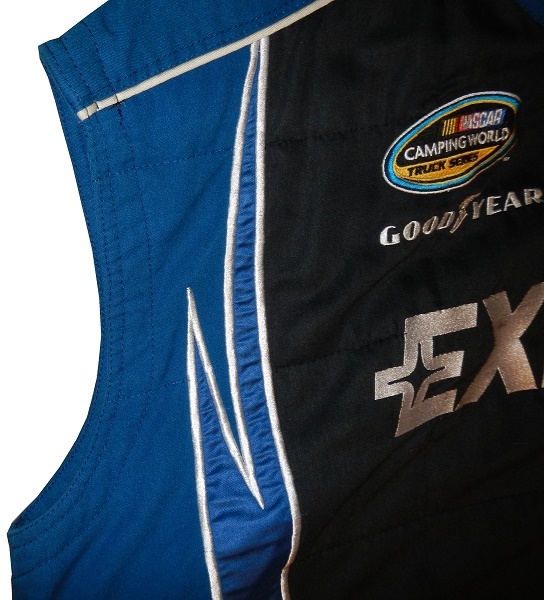 Since this is part of The Vest Project, you know that they had a vest for this sponsorship, namely this Impact example. From what I’ve been able to determine, the pit crews wore these designs for most of the races Exide sponsored. These include: 14 races in 2011, 2 for Mark Martin, 12 for James Buescher. 4 races in 2012 for James Buescher, including his win at the 2012 UNOH 225. 3 races in 2013, 2 for James Buescher, including his win at the 2013 Fan Appreciation 200 Presented by New Holland, and one for Brandon Jones. Finally, there were four in 2014, 1 for Ron Horniday Jr., and 2 for Brandon Jones. The vest itself is an Impact vest, though from looking at it, you wouldn’t be able to figure that out. All the Impact logos have been removed. 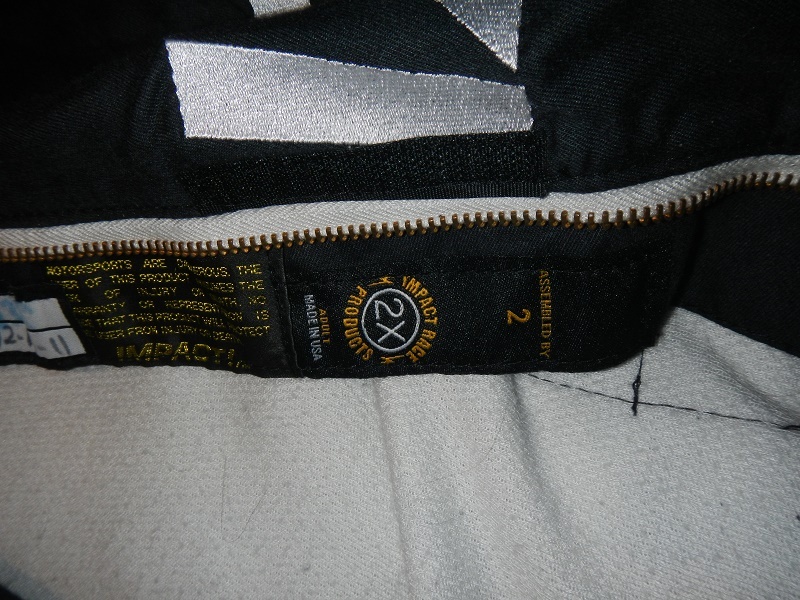 Though I wasn’t able to find a real explanation for this modification, the fact that these vests were used for a few races over many seasons, and the fact that the driver suit manufacturer would periodically change, would leave me to believe that this modification was done to avoid rumbling from the driver suit manufactures who weren’t Impact. The vest is black with a blue design up the side. 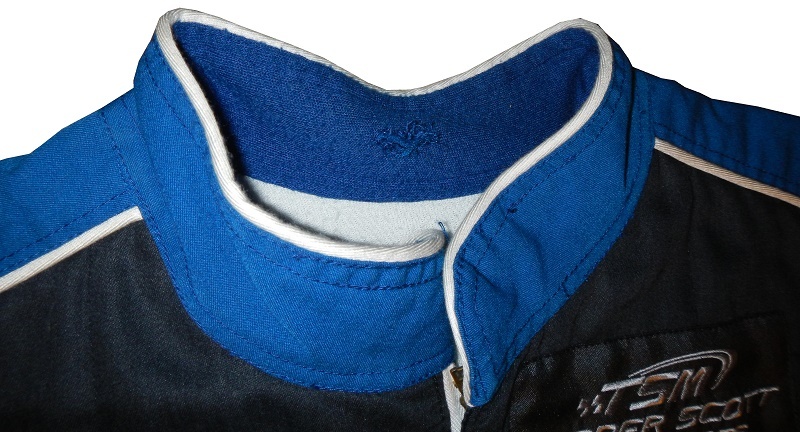 The collar is a standard design, and has has a hole in the back of the neck area. 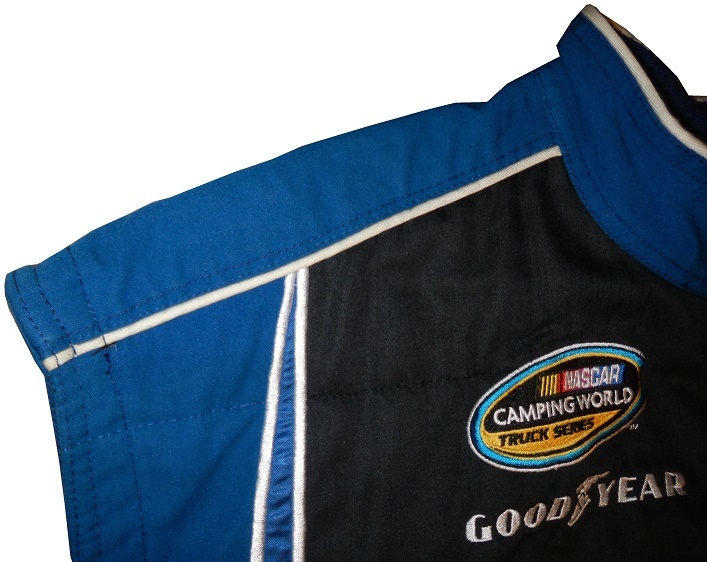 The right chest features a CAMPING WORLD TRUCK SERIES logo and a GOODYEAR logo. 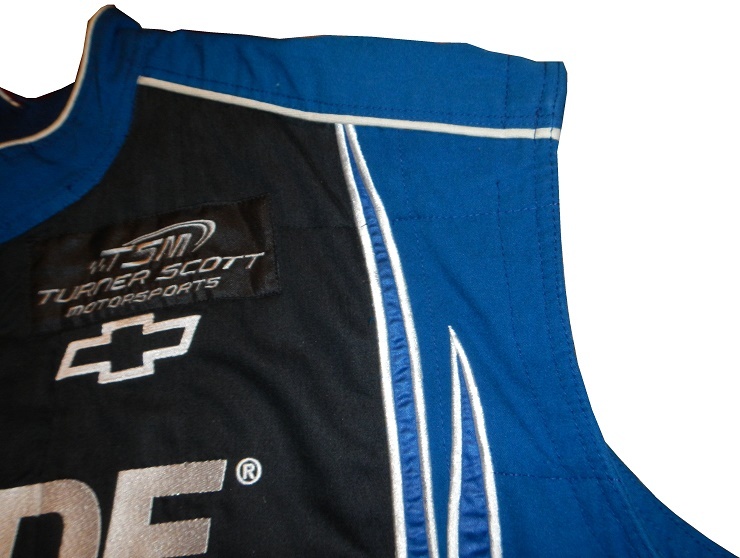 The left chest features a Cheyv bowtie and a Turner-Scott Motorsports logo, which is on a patch, which has then been sewn into the vest. 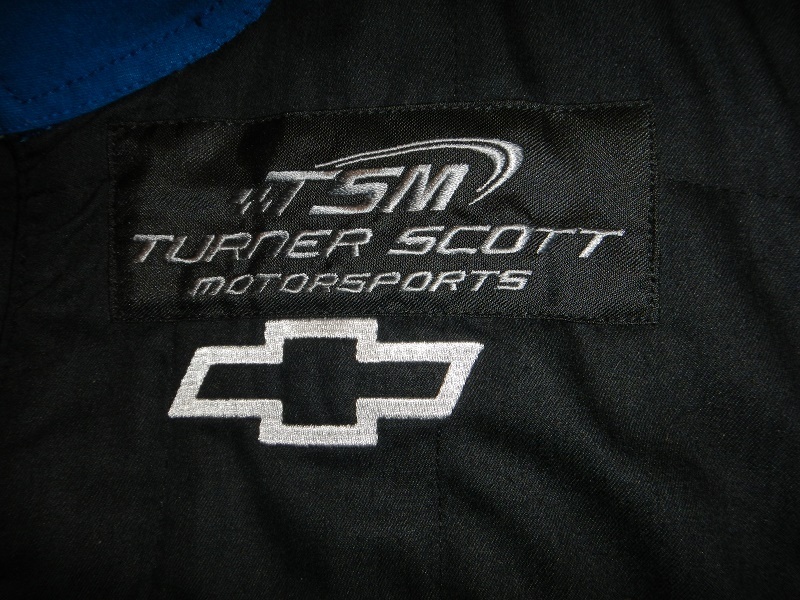 In 2011 and 2012, Turner-Scott Motorsports was simply Turner Motorsports. That changed in 2013, when minority owner Harry Scott Jr. increased his share of the ownership, and the team became Turner-Scott Motorsports. 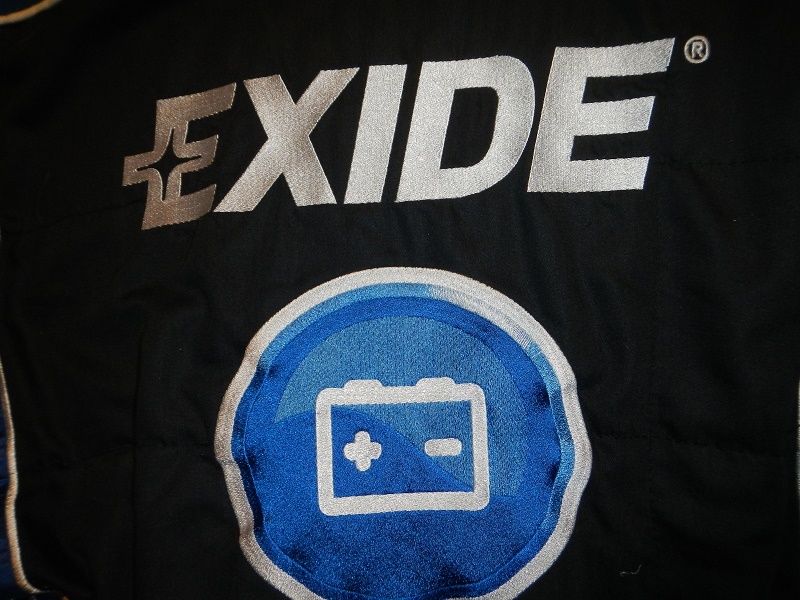 The front chest features a large EXIDE wordmark-I’m going to start using that term a bit more-embroidered into the black fabirc. 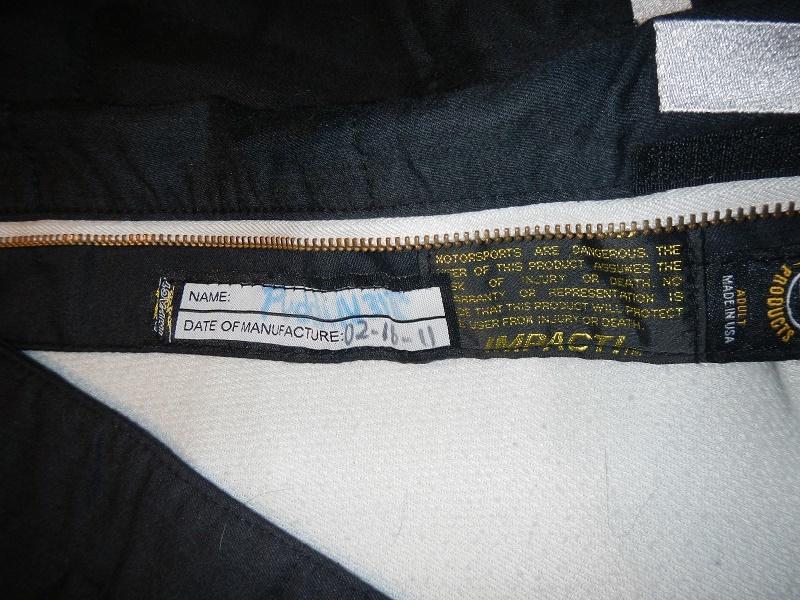 The Impact warranty label, as well as the size tag are inside the front zipper area. 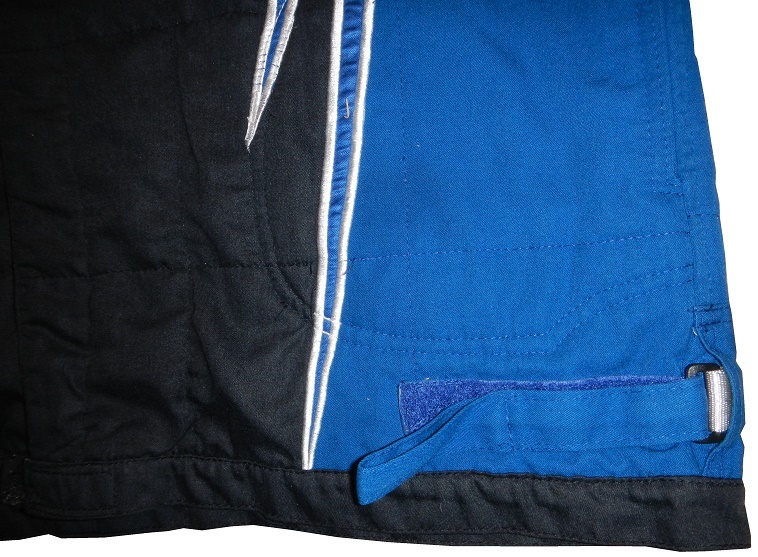 The hems have those Velcro straps on either side for driver comfort. 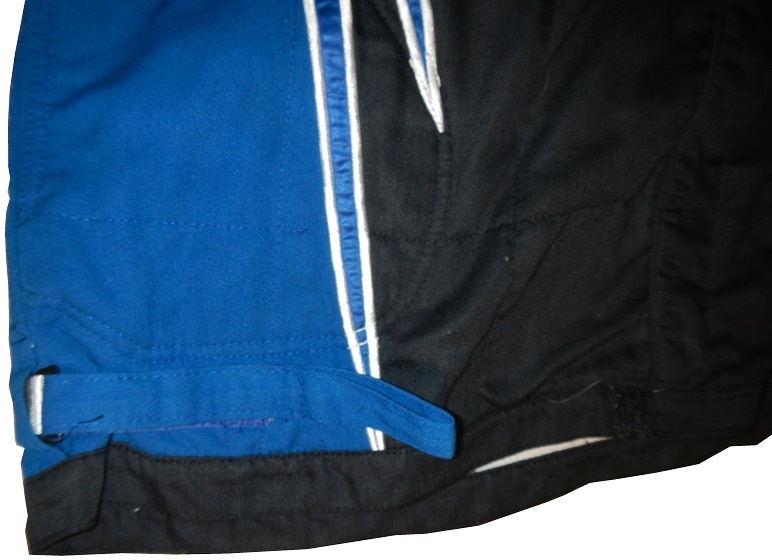 The shoulders have unadorned blue epaulets, with the Impact logos removed. The sleeves are the standard vest sleeve. 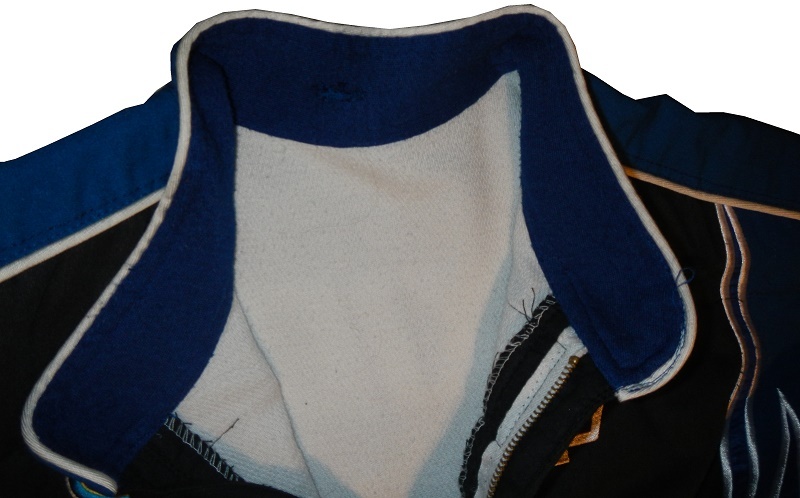 Aside from the hole in the back of the neck, the back of the vest shows no wear at all. 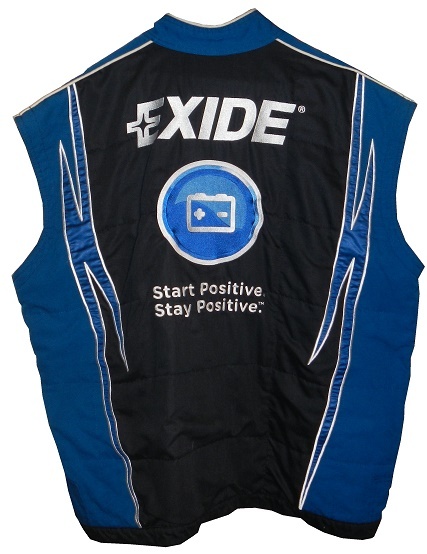 The back torso features a large Exide wordmark, with a circular logo underneath, and the phrase “Start Positive, Stay Positive” below it. Turner-Scott was somewhat of a powerhouse in NASCAR series which have the tendency to be dominated by Cup drivers, though they never had a Cup team themselves. Sadly, Turner-Scott is no more, after a series of lawsuits from Turner and Scott against each other led to the death of the team. The Truck Series team was sold, the Xfinity program went to Chip Ganassi, and Harry Scott founded Hscott Motorsports. It was sad that a team as good as that died the way it did. Next week, we will look at a piece devoted to Turner-Scott Motorsports.